Plans Drawn aims to provide the householder with a best advice source for all aspects of extending your home. From information on Planning and Building Regulations approvals to advice on hiring builders, we can provide you all the help you need. From a simple home extension, a loft conversion or your own dream house, you can browse our pages for all the information you need. 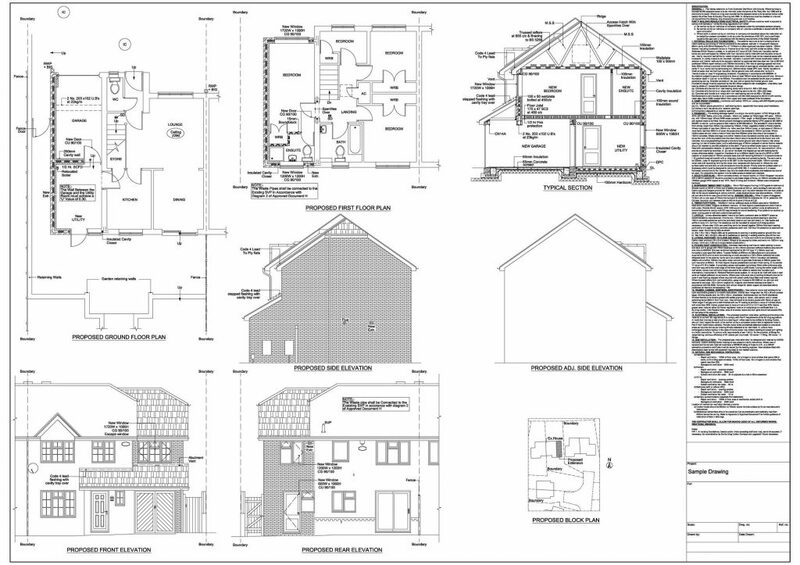 Plans Drawn main service is the preparation and submission of the architectural plans that you require for your home extension for Local Authority Planning and Building Control approval. We prepare the architectural plans required for your home extension for Local Authority Planning and Building Control approval. We provide the necessary plans/drawings for all types of home extensions and internal alterations (i.e. Conservatories) or new buildings. Plans Drawn will deal with all the necessary paperwork and liaison with the Local Authorities for your applications. Plans Drawn will act as clients agent for all planning and building regulation applications through to completion. All planning applications require an O/S site plan to be accepted as a valid application. These are often attached to house documents i.e. land registry documents. Your solicitor may have a copy. All planning applications must be accompanied by an O/S site plan for your property if you do not have one you will need to purchase one from your Local Authority they generally cost about £30.00, although this does vary from department to department. Generally you require building regulation approval for alterations of a structural nature both internally and externally. This would include the use of steelwork beams in structural walls, enlargement of existing window openings and below ground drainage. Do I need a Contract? Yes.<br /> What sort of Contract do I need?<br /> If you have a professional advisor i.e. an Architect, Designer or Engineer they should be able to advise you on these matters and the type of contract that would suit you best. Nowadays there are many different types of mortgage available offering various financial incentives to the potential borrower. They can be obtained from a variety of sources such as banks, building societies, and other lenders, or via an intermediary. Simply fill out your details, together with a brief description of your desired home extension. We can arrange for one of our surveyor’s to visit you in your home to discuss your requirement’s for your home extension. They can discuss with you any design matters with which you are unsure of or suggest alternative ideas when you do not quite know what you want. They will also advise you on any limitations that you are likely to encounter in the Planning and Building Regulations process.